Know how to assess the ecological state of coastal ecosystems by determining how to distinguish natural variability from the impact of human activities. The research conducted by the Institute focuses on the comprehension of the physical, biogeochemical or biological processes that can be studied using novel ocean observation and modelling techniques. In physical oceanography, these studies focus on the dynamics of the global ocean, from the Atlantic Ocean to the Mediterranean Sea in particular, on the oceanic mixed layer and its interactions with the atmosphere and ice. In coastal science, research also focuses on characterising the impact of human activities on the marine environment: chemical contamination, eutrophication, degradation or restoration of benthic habitats, influence of various inputs on the composition of plankton, particularly toxic phytoplankton, modifications of sedimentary dynamics, etc. Its studies contribute to the characterisation and the study of benthic biodiversity and pelagic biodiversity, particularly phytoplankton, through a dedicated observation network (REPHY). Its studies also contribute to sustainable aquaculture through an ecosystem approach that relies on the study of equilibria in the food chain as well as potential use conflicts among the various human activities on the coast. 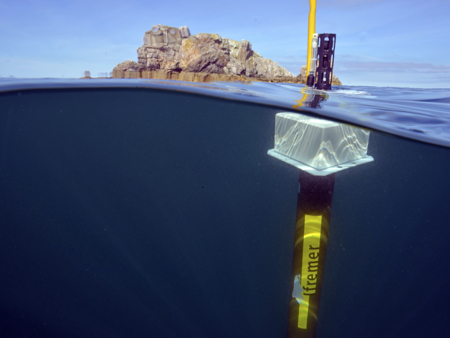 ODE ensures the collection of data from in situ instruments, coastal samples and satellites. It designs and implements data processing systems, data analysis and data dissemination. It develops numerical modelling tools to simulate the functioning of the physical ocean, marine ecosystems and exchanges at interfaces (sea-land, ocean-atmosphere). The Department contributes to regulatory environmental and water quality monitoring in coastal waters through observation and monitoring networks that it designs, operates or coordinates as mandated by public authorities. The continuous improvement of monitoring networks, and the utilisation of data obtained to improve knowledge are also important undertakings. The objectives of the Spatial and Physical Oceanography Laboratory (Laboratoire d'Océanographie Physique et Spatiale— LOPS) are to document the state of the ocean and its variability to better understand the physical and biogeochemical processes that govern ocean currents, the structuring of pelagic ecosystems and the observed state of the sea surface. The LITTORAL research unit is dedicated to the observation, study and assessment of coastal ecosystems using the monitoring networks deployed across the country that it operates or oversees. The Coastal Environment Dynamics (Dynamiques de l’environment côtier — DYNECO) research unit contributes to the understanding of the natural processes and the direct or indirect human-induced (climate) disturbances involving coastal physics and ecosystems, strives to identify the determining factors behind the observed situations and develops tools and methods to assess and forecast the environmental status of the coastal environment. The Information System for Integrated Management and Monitoring (Valorisation de l’Information pour la Gestion Intégrée Et la Surveillance — VIGIES) service provides operational and methodological support for research units in charge of observing and monitoring the coast.